Mecum’s Kansas City auction event next month will see at least one glorious gold performance machine go up for bid: a 1968 Shelby GT350 Mustang convertible in Sunlit Gold Metallic. The car is a pretty rare bird, being one of just 404 Shelby GT350 convertibles built for 1968, one of 15 examples in this color and trim, and one of two built as-equipped. This Shelby Mustang is in “highly-original condition,” according to the lot description on Mecum.com. 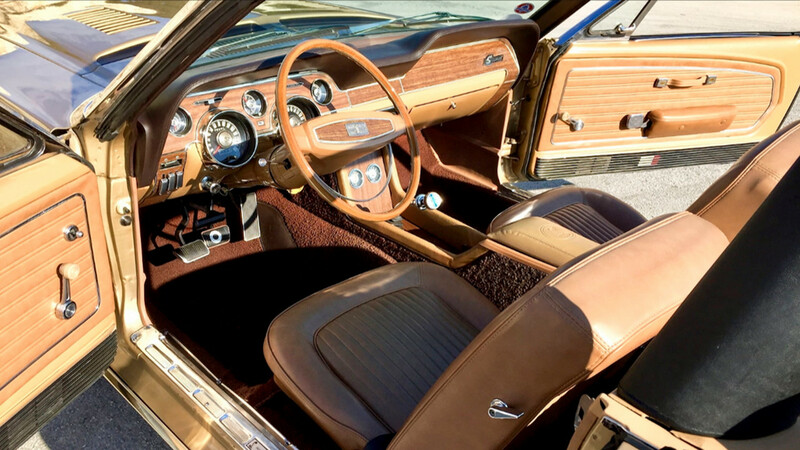 It wears its original floor pan, body panels, brown carpet, and tan interior, with the later 302-cubic-inch V8 stuffed under the hood. The engine, factory-rated at 250 horsepower, sends its torque to the rear through a 4-speed manual transmission. The white convertible top with glass backlite is power-operated, and the Shelby was optioned with the extra cooling package and visibility group, according to Mecum. It’s true that the Shelby GT350 became a bit less desirable from 1968 through the model’s original discontinuation after 1970, owing to its greater curb weight and less-potent 302-ci Windsor V8. It’s also true that a soft top is not necessarily what you want on a performance car, as it lends itself to increased chassis flex. However, it is an unmodified Shelby, and it looks rather brilliant in Sunlit Gold Metallic. We don’t imagine it will have any trouble selling when it crosses the auction block in Kansas City next month. For more photos and info, check out the original lot description on the Mecum website.